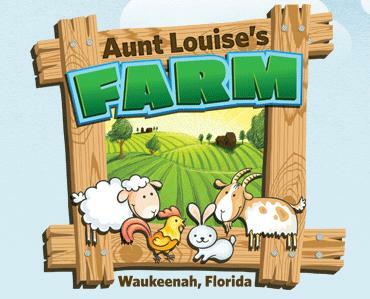 Aunt Louises Farm is located in Jefferson County, more specifically Waukeenah, Florida. Our farm is forever growing, expanding and evolving. About 18 years ago we bought ourselves a goat. No one told us that 1 lone goat is an unhappy goat! So, of course, we had to buy another one. Then we bought a few chickens so we could have fresh eggs. Fast forward to 2016. We now have quite a menagerie of critters, as I like to call them. Currently, we have 30 or so goats, 9 sheep, 14 ducks, 3 alpacas, 5 pigs, 3 guinea fowl, 40+ chickens, 15 rabbits, 6 zebu cattle, 3 dairy cows, 2 Great Pyrenees, 8 mini horses, sebastopol geese, turkeys, and peacocks. (And you never know what Aunt Louise might bring home tomorrow!) We now produce enough eggs to sell, raise a lot of our own meat, have enough lard to make soap and sometimes have our own fresh goats milk. In the fall we open our farm to the public for about six weeks. Entry is $8 per person, children 3 y.o. and under are free. You are able to explore the three-acre corn maze that has lots of scarecrows and silly signs for entertainment. Additionally we have homemade jams, jellies, soaps, pound cake in a jar, fresh pecans (hopefully) and pumpkins. You may also buy snacks to feed the animals. For added fun we have a tour ride with Aunt Louise, a barrel train ride, face painting, and two corn pits to play in. We will have concessions for sale: hot dogs, snow cones, corn bread waffles and drinks.